All grains start life as whole grains. In their natural state growing in the ﬁelds, whole grains are the entire seed of a plant. This seed (which industry calls a “kernel”) is made up of three key edible parts – the bran, the germ, and the endosperm – protected by an inedible husk that protects the kernel from assaults by sunlight, pests, water, and disease. Whole grains contain all three parts of the kernel. Reﬁning normally removes the bran and the germ, leaving only the endosperm. Without the bran and germ, about 25% of a grain’s protein is lost, and are greatly reduced in at least seventeen key nutrients. Processors add back some vitamins and minerals to enrich reﬁned grains, so reﬁned products still contribute valuable nutrients. But whole grains are healthier, providing more protein, more ﬁber and many important vitamins and minerals. Click here to see a graphic that shows what’s lost when wheat is reﬁned, and the little bits that are added back — only a few components, and not in their original proportions — when grains are enriched. Here’s another graphic for rice, that shows similar diﬀerences between whole grain (brown) rice and white (reﬁned) rice. Whole grains may be eaten whole, cracked, split or ground. They can be milled into ﬂour or used to make breads, cereals and other processed foods. 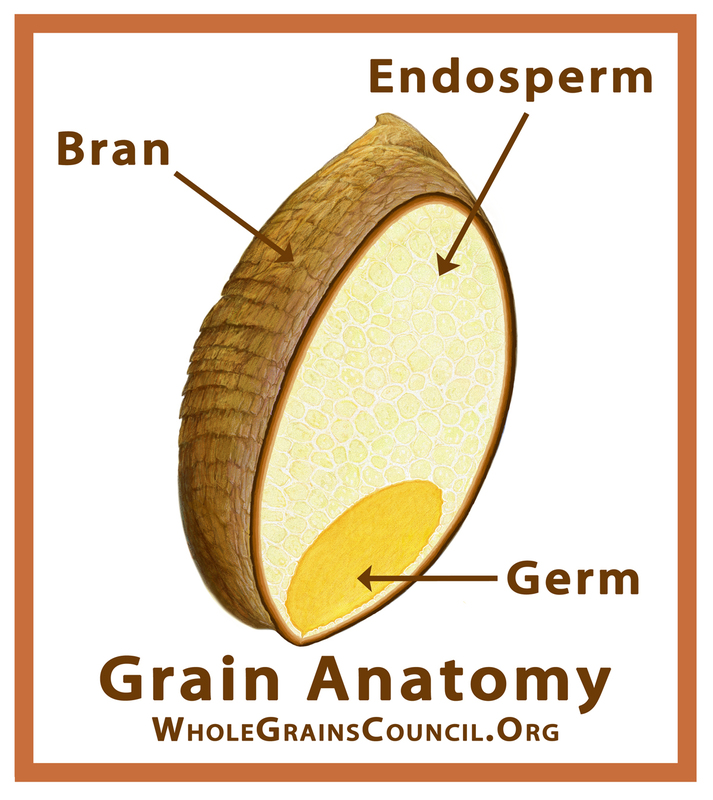 If a food label states that the package contains whole grain, the “whole grain” part of the food inside the package is required to have the same proportions of bran, germ, and endosperm as the harvested kernel does before it is processed. Whole grains currently make up far less than half of all grains on supermarket shelves (though growing every day!). At a time when health professionals urge consumers to eat at least half of their grains as whole grains, our Whole Grain Product Finder can make ﬁnding whole grains a snap.